Is your data center facing increasing demands for data retention, security and availability? IBM storage media solutions are designed to help reduce your costs while providing you with the assurance that your data is safe and secure. 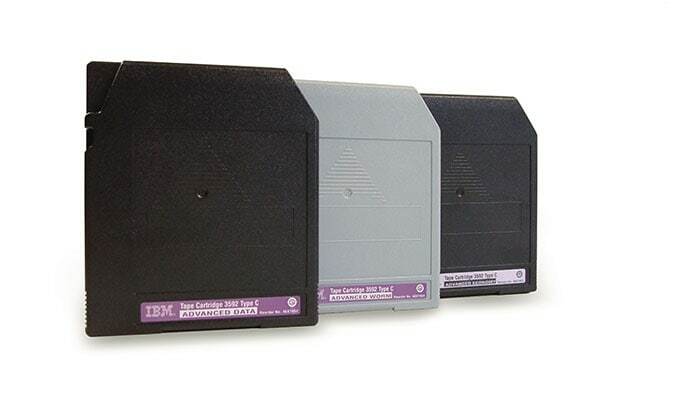 With 65 years of tape storage innovation, IBM continually raises the bar on protecting your data. IBM extensively tests our media on IBM tape drives and libraries to drive manufacturing and quality improvements. You gain peace of mind in sourcing media from a trusted, time-proven tape technology leader. Delivers the advanced durability, quality and innovation that you expect from IBM. Protects your investment by supporting media re-use, which enables the drive to reformat and upgrade prior-generation media cartridges. Enterprise high-capacity tape media is designed for reliability and supports media re-use by enabling the drive to reformat and upgrade prior generation media cartridges. Delivers 12 TB native capacity and up to 30 TB of compressed capacity. Delivers 6 TB native capacity and up to 15 TB of compressed capacity. Delivers 2.5 TB native capacity and up to 6.25 TB of compressed capacity. Provides up to 3 TB (with 2:1 compression) of capacity in a single cartridge. Get in-depth information to make the most of your investment. Discover IBM tape systems for reliable data protection and retention. For warranty support on IBM branded media in the United States and Canada only, contact ibmmedia@us.ibm.com. For warranty support on IBM branded media in all other geographic locations, please contact an authorized IBM media distributor. Select your region and distributor from the list below. Note: If the library isn’t able to copy the data off onto another cartridge, then call an IBM ServiceRep to request the cartridge sent off for data recovery.